President Faust, members of the Harvard 2)Corporation and the Board of 3)Overseers, members of the faculty, proud parents, and, above all, graduates. 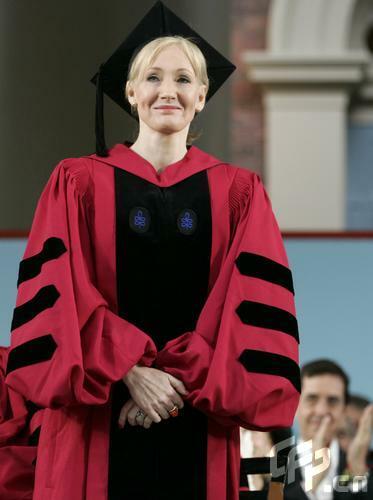 The first thing I would like to say is “thank you.” Not only has Harvard given me an extraordinary honour, but the weeks of fear and 4)nausea I have endured at the thought of giving this 5)commencement address have made me lose weight. A win-win situation! Now all I have to do is take deep breaths, 6)squint at the red banners and convince myself that I am at the world’s largest 7)Gryffindor reunion. On this wonderful day when we are gathered together to celebrate your academic success, I have decided to talk to you about the benefits of failure. Half my lifetime ago, I was striking an uneasy balance between the ambition I had for myself, and what those closest to me expected of me. I was convinced that the only thing I wanted to do, ever, was to write novels. However, my parents, both of whom came from 8)impoverished backgrounds and neither of whom had been to college, took the view that my overactive imagination was an amusing personal 9)quirk that could never pay a 10)mortgage, or secure a 11)pension. I cannot remember telling my parents that I was studying Classics; they might well have found out for the first time on graduation day. I would like to make it clear, in 12)parenthesis, that I do not blame my parents for their point of view. There is an 13)expiry date on blaming your parents for steering you in the wrong direction; the moment you are old enough to 14)take the wheel, responsibility lies with you. What is more, I cannot criticise my parents for hoping that I would never experience poverty. They had been poor themselves, and I have since been poor, and I quite agree with them that it is not an 15)ennobling experience. Climbing out of poverty by your own efforts, that is something on which to pride yourself, but poverty itself is romanticised only by fools. Now, I am not going to stand here and tell you that failure is fun. That period of my life was a dark one, and I had no idea that there was going to be what the press has since represented as a kind of fairy tale 16)resolution. So why do I talk about the benefits of failure? Simply because failure meant a stripping away of the 17)inessential. I stopped pretending to myself that I was anything other than what I was, and began to direct all my energy into finishing the only work that mattered to me. Had I really succeeded at anything else, I might never have found the determination to succeed in the one arena where I believed I truly belonged. I was set free, because my greatest fear had been realised, and I was still alive, and I still had a daughter whom I adored, and I had an old typewriter and a big idea. And so rock bottom became the solid foundation on which I rebuilt my life. Failure gave me an inner security that I had never attained by passing examinations. Failure taught me things about myself that I could have learned no other way. I discovered that I had a strong will, and more discipline than I had suspected; I also found out that I had friends whose value was truly above the price of rubies. The knowledge that you have emerged wiser and stronger from setbacks means that you are, ever after, secure in your ability to survive. Life is difficult, and complicated, and beyond anyone’s total control, and the humility to know that will enable you to survive its 18)vicissitudes. Step 1 别再怨天尤人 There is an expiry date on blaming your parents for steering you in the wrong direction. Step 2 肯定每一分回报 Climbing out of poverty by your own efforts, that is something on which to pride yourself, but poverty itself is romanticised only by fools. 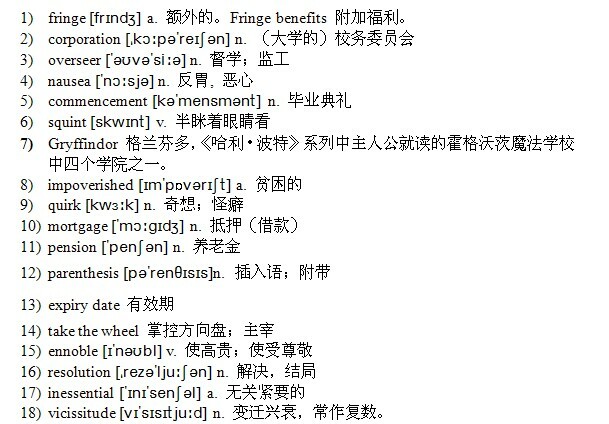 Step 3 激起破釜沉舟的信心 Failure meant a stripping away of the inessential.